OK, let me start this by saying, I always thought corn dog, was ONE word. Google and I have spent some time together learning it is 2 words. Yea, never knew, and wondering how often I have messed it up and made myself appear completely illiterate. I don't think I know a single person who doesn't like corn dogs. My son used to devour them like they were candy and when we would go to the boardwalk I could count on buying at least 4! As far as making corn dogs at home. Not so successful, I will be honest. I have tried a few different recipes, I even tried a corn dog mix that I only had to add water or milk to, I successfully failed at those as well! I just never seemed to get it all right before. I finally just gave up. However, the other day a bag of "Yellow Cornmeal Mix" presented itself to me and I wondered if I should get back up on that saddle again. The answer was yes, but I decided to ditch the stick and go for a bite size version. I like my corn dogs a little crunchy and I achieved it with these little delicious dogs! Combine all ingredients except the last 1/2 cup flour. Mix until smooth and completely combined. Add the 1/2 cup of flour for dusting to a bowl or plate. Heat peanut oil (or oil of choice) to 340 degrees. I used about 3 inches of oil. I cut 7 hot dogs into 3rds. 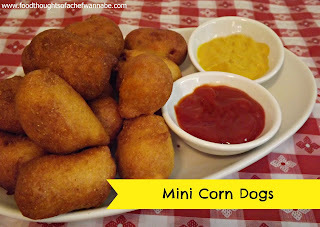 This yields about 21 mini corndogs. Dust them in the flour and using a skewer or your fingers, dip them in the batter and drop into oil. I use the skewer to poke it to put it into the oil If you don't mind potentially becoming fingerless, go ahead, I dare you! Fry until golden brown, approximately 2-3 minutes! Remove from oil and let drain on paper towels or whatever you choose! Serve with whatever condiments your family likes and enjoy! I prefer mustard or cheese sauce! Hi! I have actually never had a corn dog. I am going to try your recipe and see if the children like it. Thanks for sharing! Hello Tanisha! So glad you are going to try them. These are a very crispy version because that is what I like best! You can also used cut up hot dogs if you wish! Let me know how it turns out!